In this article I explain how to create a Worklight pattern on SCAS using the Virtual Application Builder. I explained in the article “Create Worklight Pattern from Worklight Developer Edition for SCAS” how to automatically create a Worklight pattern for you application using the Worklight Developer Edition environment, but of course you can manually design it using the Virtual Application Builder. A Worklight pattern contains at least 4 components and an optional 5th one, the adapters. 1) Worklight Server: This component will create under the cover a WebSphere application Server which old the ear you can generate via ant scripts or automatically using the Worklight Developer Edition. 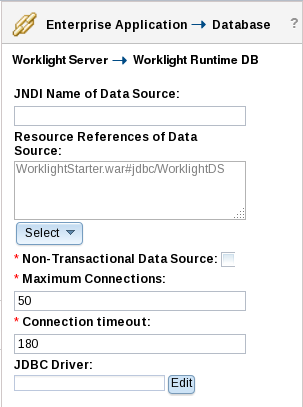 2) Worklight Runtime DB: This database will hold the runtime information for Worklight. You don’t have to provide a schema as it is already embedded in the component but you have to set the DB Workload Standard. Check this article to know more about it! 3) Worklight Report DB: This database is used for reporting and as the runtime DB you don’t have to provide the schema but you will have also to specify the DB Workload Standard. 4) Worklight Application: This component is used to define which application you would like to deploy on your Worklight environment. It needs a file (*.wlapp), this file is generated by the Worklight Developer Edition plugin and located in the bin directory of your worklight project. You will have to upload this file in the component. 5) Worklight Adapter: When you create a Worklight application, you can create adaptors to collect data from other systems and inject them in your application. The Worklight Developer Edition plugin generated a *.adapter file which contains the definition of the adapters you defined in your project, you will have to upload this file in the component. The *.wlapp and *.adapter can be changed once the deployment is done via the “management” -> “Operations” of the SCAWS console. This allows you to create new version of your application and upload them on the fly. You can use also the “SCAWS pattern deployer” which is an Eclipse plugin you can install in your Worklight Developer Edition environment in order to upload new version of the “*.wlapp” and “*.adapter”. Now, you still have to link all these components. There only the link between the “Worklight Server” and the databases that requires extra parameters. Click on select and choose the right jdbc connection for your database (Runtime and Report). Now, you can save your pattern and deploy it! This entry was posted in IBM Cloud, IBM SmartCloud Application Services, Worklight on SCAS and tagged #ibmcloud, #SCAS, #SCAWS, #Worklight by ITDoVe. Bookmark the permalink.